Losing power at home is a total bummer. There's never a convenient time to experience a blackout. But, now there is a safe and affordable way to directly power your home with a portable generator so that you'll never have to deal with this major inconvenience again. And, you can watch an installation and how it all works in our video below. When your neighborhood experiences a blackout, it likely doesn't take long before the sound of running portable generators begins to fill the air. 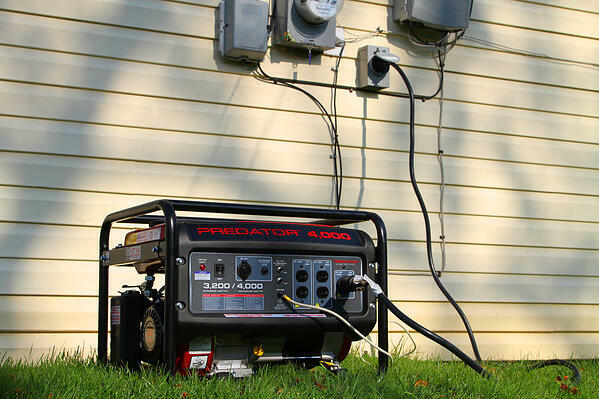 There are a handful of ways to use a portable generator to get the power back in your home, but one method is clearly the safest and most convenient. Portable generators usually have multiple outlets that allow you to plug in extension cords that you can then run into and through the house to power various items. This method will work, but it has its limitations. It also requires that doors or windows to the outside be open and dealing with multiple extension cords could be a tripping hazard and is definitely not convenient. Backfeeding is the process of plugging a cord from a portable generator into a home outlet in order to feed electricity directly into the home. Can you just backfeed your generator to your home? Well, you coooouuuuld, but it's especially dangerous, even deadly; not only to you and your household, but also to the utility workers on the line. You can read more about the dangers of backfeeding here and here. The ultimate solution for powering your home with a portable generator involves the installation of a manual transfer switch. A manual transfer switch interfaces with your home's electrical system and is connected to an outlet called a power inlet box that is installed on the exterior of the house. As you can see, pairing a portable generator with a manual transfer switch is a safe and convenient way to power your home during an outage. And, it's much more affordable than adding an automatic home standby generator. Before using a portable generator, we encourage you to read over the owner's manual that came with your generator and check out our Portable Generator Safety Tips. If you'd like to learn more about generator solutions for your home, please give ECI Comfort a call at 215-245-3200 or click the button below.